The National Weather Service issued an update at 1 p.m. today regarding the threat of severe weather. The highest chances will be to the northwest of the Regional Radio listening area. Main severe thunderstorm development will occur late afternoon and storms will push eastward this evening. Areas west of the Illinois River will be at risk from 5-8 p.m., with the threat extending east toward Interstate 55 between 6-10 p.m., followed by east central Illinois later in the night time hours from 8-11. The main concerns are large hail and damaging wind gusts, though a few tornadoes are possible. 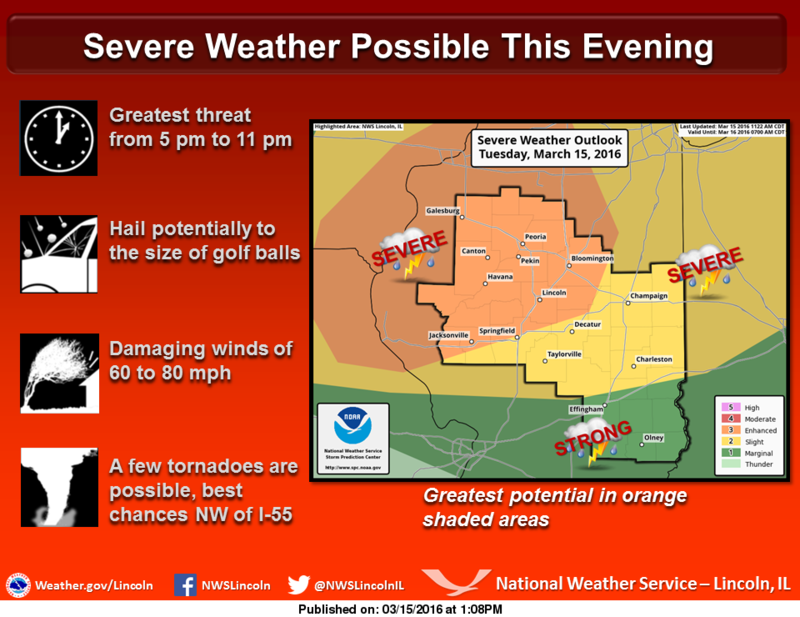 The National Weather Service in Lincoln stated the best chances for tornadoes are northwest of Interstate 55 and as the evening progresses, the threat will shift more toward the high winds. Stay tuned to Regional Radio News and taylorvilledailynews.com for updates and information.